S.M. 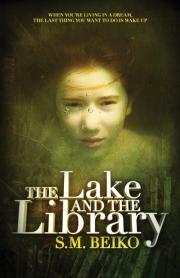 Beiko’s The Lake and the Library is nominally a story about growing up, and the feeling of nostalgia for things lost and things changing. It is about the discovery of a library filled with books that are gateways to fantastic worlds, pages that become birds, clouds, and wings to lift her to new highs of fantasy. The library is a shifting space, becoming other worlds as walls are expanded by the great breadth of adventure and fantasy within the covers of the books it houses, literally shifting to become fantastic spaces from beloved classics. And the library holds a boy, unable to speak aloud, but able to speak volumes in the universal language of fantasy with Ash as his co-creator of worlds of adventure. The first part of the novel evokes the highs of an escape, new experiences, exiting distortions of reality, and only in the latter half of the novel does it become clear that this is an addict’s tale. Ash begins to experience the dangers and draws of being in a continual state of escape. Reality begins to wear thin for her and she begins to distance herself from anyone who doesn’t enable her habit, anyone who pulls her back to reality. Friends, family, all begin to be sacrificed to her need, her desire to get away from herself, her world, and all that feels too mundane, too real to matter. The world outside of the library begins to shift, become unstable for Ash, losing its substance as something grows within her, thorns that tear into her skin, holding her, consuming her from the inside and pulling her back to the library. Fantasy begins to eat into reality, making the real a pale and lifeless substitute for the highs of the fantastic. And when reality gets to be too much, a sound like rushing water surges through her, enveloping her in its wash of abstraction, removing her from a world that seems too harsh, too sharp, too real for her to touch. The water cushions her while it draws her deeper, washing away signification and everything that made her who she was. The library is haunted by memory, nostalgia, the dreams of things lost and forgotten, and yet it has power, a deep hold like thorns in the veins of those who seek to escape, those willing to uproot themselves and lose the ground that feels like it is only holding them in place. Libraries are beautiful places, deep places, charged with a depth made of the weight of tales, and this depth can both add to one’s story, but can also consume and obscure one’s story. Ash finds herself suspended in a depth of tales that renders her as a drop in a lake, her story washed away by the weight of other worlds more alluring to her than her own life. To find out more about the work of S.M. Beiko, visit her website at http://www.smbeiko.com/ . This entry was posted in Fiction Book Reviews and tagged addiction, books, dreams, escapism, fantasy, ghost, library, memory, nostalgia, reviews, S. M. Beiko.